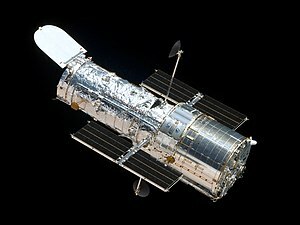 The Hubble Space Telescope as seen from the departing अंतरिक्ष शटल अटलांटिस, flying Servicing Mission 4 (STS-125), the fifth and latest human spaceflight to it. ↑ Ryba, Jeanne. "STS-31". NASA. अभिगमन तिथि March 7, 2012. ↑ HST Program Office (2003). "Hubble Facts: HST Orbit Decay and Shuttle Re-boost" (PDF). Goddard Space Flight Center. अभिगमन तिथि May 12, 2009. ↑ Kauderer, Amiko (मार्च 26, 2009). "Space Shuttle Mission Overview – STS-125: The Final Visit". NASA. अभिगमन तिथि May 2, 2009.